When I decided to return to Maine some years ago, I chose to move initially to Portland. I had lived in an urban area of California for over five years and had become used to traveling everywhere by bicycle or bus. In Portland, I was pretty sure I could still live “car-less and “car-free.” And I was right. In many ways, much of Portland is still a walking city, especially the heart of downtown. I picked up a job, moved into an apartment about a dozen blocks away, walked the old brick and cobblestone sidewalks to my new work. Took pictures of my steps, the bricks and stones of the history I walked on. With landmarks such as Longfellow Square, the First Parish Church, Monument Square, and the Customs House Building, Portland leans into its past with rightful pride. Whenever I walked these streets, history would be a half-shadow away, at the edges of vision or in the cool smell of salt air. 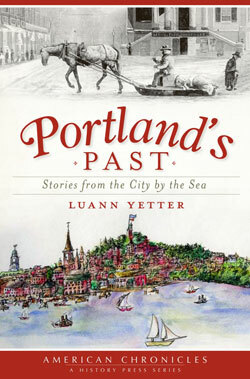 In her latest book, Portland’s Past author Luann Yetter of Farmington catches glimpses of the people and events that created the rich history of this exemplary “small city.” In crisp scenes and sketches, she takes the reader from the formation of Portland to its centenary celebration in 1886. The characters and events are sometimes famous, sometimes obscure, always intriguing. From the opening declaration of George Cleeve: “I will be tenant to never a man in New England” to the salutation at the centenary “Welcome Sons of Portland,” the reader will be witness to men and women caught in their time, living and acting as if the world a stage. The broader expanse of American history plays out as well, with Barbary pirates, the abolitionist cause, the War of 1812, and what was termed “The War of the Rebellion” of 1861-1865 swinging like starry hammers through the City by the Sea. Poets and writers, Longfellow, Frederick Douglas and such, stroll through and comment on their times. You’ll meet Pigs of Knowledge and Rods of Correction. At 126 pages, the book is not a comprehensive history of Portland and it does not pretend to be. But it is a tumultuous read, with standard “important” events, such as a visit by the Prince of Wales, mingling with reports of neighborhood snowball fights between the lower-enders and the upper-enders. And what is the significance of that? As in her previous work, “Remembering Franklin County,” Ms. Yetter reveals this history of Portland in a kind of crazy-quilt fashion. Bits of history here, a biographical sketch there. It is a strongly researched book, with detailed information and articles from a variety of archives and resources, accompanied by over 70 period drawings and photographs. It starts with the early settlement of the area and comes to a close with the centenary celebration of the city proper in 1886. Many a chapter starts with a blast of activity. “Lieutenant Dudley Davenport was lying in his berth….”, or “Edward Preble was hard at work hoeing potatoes….”. Frequently the chapters open with no indication of the month or year this event is taking place. Characters appear, Tolstoyian, with no clear introduction, but perhaps related to characters mentioned earlier in the book. Your task, dear reader, is to pick up on references, see how fast you can infer the connections, whether they be a last name of a character or perhaps a sly allusion to an ongoing event (such as the War of the Rebellion, which means that Lt. Dudley is lying in his bunk sometime between 1861 and 1865). Edward Preble ends up being related to one of the early settlers - he’s now 16 - what year is it? It’s somewhat like the opening sequences to episodes of Dr. Who, or maybe Peabody’s Improbable History, wherein our hero must figure out “where am I?” and, more importantly, “why?” Yes, I realize I’ve further confused you with an obscure reference of my own. Isn’t this fun? Actually it can be. Granted, sometimes I was frustrated, I wanted to know the exact date of what’s going on. I am used to history being “taught” as a series of dates to remember, and that the dates will be linear. This happened and then another thing happened. In “Portland’s Past”, Time is more fluid, with some events passingly referred to without specifics (even if they be known). For example, the visit by the Prince of Wales. I never did find out when exactly he visited, or why his time in Portland turned out to be Mayor Joseph Howard’s “luckiest day.” In another example, one whole chapter on privateering and the rum trade is plunked into the middle of the work, book-ended by seemingly unrelated stories. And the chapter itself sprawls from 1670 to 1812, close to the time-line of the whole book. It’s enough to make you waddle out of your comfy chair and do some of your own research. Upcoming Event Note: Luann Yetter, instructor at the University of Maine at Farmington, will be presenting a reading and signing of “Portland’s Past” at Devaney, Doak and Garrett on Broadway in Farmington 7 p.m. on Friday Jan. 13. If it's as good as the Farmington book, it should be a great read.